“It has been an adventure to arrive at this moment,” began Aline Khoury, the media coordinator for the third Qalandiya International Festival (QIF). It is easy to see what she means. The event took two years to organise. Exhibits are hundreds of miles apart. One of the venues, the West Bank, is subject to a foreign occupation. Another, Gaza, is an open prison surrounded by fences and tanks. Given all this, even basic coordination between organisers was a huge challenge. The Gazan participants could only be contacted via Skype. That the Qalandiya festival is a sprawling cultural festival – with two-hundred participants and across ten cities – is a remarkable achievement. Considering the logistical difficulties they faced, moreover, it is unsurprising that the organisers were proud to highlight the international scope of their project. “We are keen for international visitors and guests to join in the conversations” the festival raises, explained Khoury. Mahmoud Abu Hashhash, on the project’s steering committee, agreed: the festival is important as an “incubator of Palestinian culture” abroad. Not that venues are sprinkled around randomly. Rather, all the host cities have a special link to the sea. This is especially important in a Palestinian context. Many Palestinians, confined to the West Bank, have never seen the sea. And in Gaza, people are trapped by it. Its ports are closed, and its fishermen risk Israeli shelling if they sail far from shore. It makes sense, then, that the organisers picked “cities on the sea” to host QIF, explained Khoury. Indeed, the festival aims to restore the sea “to the consciousness” of Palestinians, Abu Hashhash continued. Optimistic cultural engagement – through art exhibitions, poetry and talks by historians – seeks to smash the stereotype that the sea is a purely traumatic place for Palestinians. It is not for nothing, after all, that the 2016 QIF is called 'This Sea is Mine.’ The line is borrowed from the Palestinian national poet Mahmoud Darwish. As two of the curators for the Gazan exhibitions explain, “the sea is part of our daily lives.” Palestinian links to the sea, and return to it, should be celebrated and not “reduced to a rigid slogan” devoid of cultural or historical context. All this means the QIF is on firm conceptual ground. The organisers clearly put a lot of thought into how to intelligently combine the sea, and Palestinian return to it. This is unsurprising given the pedigree of many involved in the project. This includes representatives from some of Palestine’s top cultural institutions, like the Palestinian Museum and the Arab Culture Association. In short, the sea and the 'right of return’ make a good intellectual framework for QIF. The organisers expect to welcome 15,000 visitors over the month-long run of the festival. If even some of those visitors are Palestinians who learn more about their historical and cultural links to the sea, the festival will have been a success. But if visitors want to learn about Palestinian maritime culture especially, that have to be careful. Some of the exhibits seem so diffuse that it is hard to see how they fit into QIF’s broader themes. A piece at Birzeit University, for instance, shows a photo of a girl caught in the 2014 Gaza war. The picture, taken by Khalil Hamra for AP, is iconic. 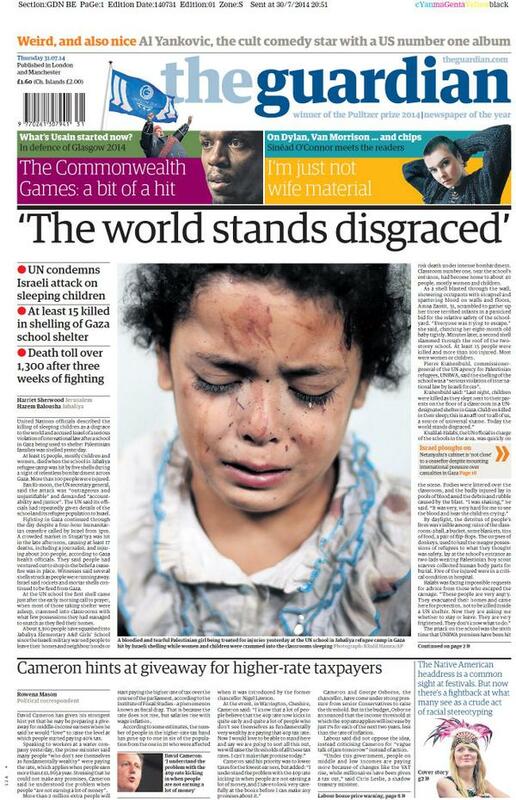 It made the front page of The Guardian. The girl is shattered. She has scars on her face, and a single tear in her eye. In an interview, played over the top of the picture, Hamra explains the background to the shot, and his reaction to this terrible scene. Certainly, the exhibit manages to hauntingly capture the Palestinian tragedy. But it is unclear how it links to QIF’s focus on return and the Palestinian relationship with the sea. This can probably be explained by QIF’s decentralised style. Each artist involved in the festival was largely free to pursue their own work. This is not a bad thing in itself. It means visitors can experience a blistering variety of art and culture. Anyway, given the scale of the festival, collaboration between individual artists was probably impossible. Having said that, most exhibits do slip gracefully into QIF’s programme. For example, in a handsome corner of Ramallah’s old town, I saw an engaging series of paintings by Samia Halabi, now living in the US, about her inability to return to Palestine. The pieces are part of the aptly-named 'Sites of Return’ exhibition. Nearby, another 'Sites of Return’ exhibit depicts a woman in various historical styles, including as a Byzantine saint. The aim is to return visitors far into Palestine’s past, before the Islamic conquest of the 7th century. In a further piece, at the Daraj Gallery in Birzeit University, Amneh Kheris and Nayef Zayed imagine a return to a peaceful Gaza, free from Israeli bombings. Their intricate cardboard models of futuristic houses jar with the shattered husks that dot Gaza today. The effect is chilling. Indeed, the giddy range of activities on offer means that even if a few feel at odds with the general theme of 'This Sea is Mine,’ there are plenty more to choose from. On October 11, Palestinian children will explore their relationship with the sea through art. A few days later, people can go on a guided tour of a village on the 1948 green line. From their balconies, residents can see the Mediterranean, but not visit it. As a cultural event, then, QIF is phenomenal. The breadth of activities, and the level of organisation required to run them, is a mark of Palestine’s lively civil society. But, at a press conference before the opening of the festival, some of the organisers had loftier aims. After the cancelled Palestinian elections “artists have a duty to represent our problems in a sophisticated manner” claimed Abu Hashhash. Institutions like Qalandiya definitely inspire people culturally. But can QIF really change political behaviour? Palestine’s intractable political disputes suggest not. As Abu Hashhash himself admitted: “Palestinian politicians tend towards personal and factional interests” at the expense of the public good. And even if the QIF can somehow affect the conduct of Palestinian politicians, Israel is a different matter. Alia Rayyan is on the festival’s steering committee and involved in organising the Jerusalem portion of the programme. I asked her whether cultural festivals like QIF could help improve the lives of Palestinian Jerusalemites given Israeli indifference to their problems. Still, the QIF can shake up Israeli policy in subtle ways. Rayyan and her colleagues have circumvented a ban on public gatherings by paying for parking spaces on Jerusalem’s streets, and hosting impromptu meetings. “In that moment we 'own’ [the parking space], so we don’t need a permit,” Rayyan explains. These hesitant shuffles forward notwithstanding, it is unclear how far the QIF can change the reality of the occupation in practice. Palestinians have fought to return to their pre-1948 homes for decades, without success. Can any cultural movement – especially one led by Palestinians – ever change actual Israeli policy? Politics aside, though, the Qalandiya International Festival promises to be a fascinating event. With so many activities and exhibitions, it is the perfect way for Palestinians to learn more about their identity and history. And for everyone else, it is an ideal first stride into the beautiful, desperate foothills of Palestinian culture. The Qalandiya International Festival runs from October 5 to October 31, in several cities.